In Innovator’s Manifesto, Michael Raynor describes a model of Disruptive Innovation that expands upon Porter’s concept of Strategic Differentiation. This is better than previous descriptions, but it still gets the categories somewhat wrong. Over time, then, the available market for the disruptive innovation will encompass that of the incumbents, and overtake them with a superior business model that delivers the same value at lower cost. This is a fantastic explanation of Disruptive Innovation, and includes everything that was explained in the previous major books about the subjects (Innovator’s Dilemma and Innovator’s Solution – both fantastic books with insights that will help anyone make better business decicsions, I can only recommend them). However, in my opinion, Raynor misses one crucial point. The point provides the same results in most circumstances, but in my opinion makes the theory both more clear and removes some of the contradictions that still remain – and explains some apparent disruptions that Raynor’s (and Christensen’s before him) models don’t predict. In my article about how Tesla is a disruption not predicted by Christensen’s model, I hold that a business model doesn’t need to have a lower cost or margin in order to be disruptive. Instead, it is enough that the products of that business model don’t appeal to the core customers of incumbents (but will do so over time), and that the cost structures necessary to develop both products optimally are mutually exclusive. In this article, I will expand on this concept, and clarify it. I believe that the concept I will describe here explain all of Raynor’s and Christensen’s cases, removes contradictions and certain elements of those theories that seem to be “a stretch” and don’t really seem to fit naturally into the theory, plus encompasses more cases that those theories cannot explain (such as the example with Tesla above). The core explanation of this new theory lies in Porter’s concept of what a strategy is: A system of trade-offs that produce a map of activities that have what he calls “Fit”. Two different strategies with internal “fit”, per this definition, cannot co-exist in the same organization. If an organization tries to do so, it “straddles” between two different activity fit systems that don’t fit with each other, and is hence required to introduce compromizes in each to make it work. This leads to sub-optimal products in both activity systems compared to having two different organizations that are each individually optimized to one or the other activity system. This description overlaps somewhat with what Christensen explains as “Processes” – but I believe that the Activity Fit system that Porter describes is more clear, more accurate, and more applicable. So what does this have to do with creating a Disruptive Business model, and what Raynor talks about? Well, whereas Raynor explains Disruptive Innovation using the two factors Nonprice Value and Cost, it can actually be described without invoking cost at all – by using Porter’s concept of Activity Fit. Introducing “Cost” into the equation is simply unnecessary, and produces the inconsistencies and the necessity to “stretch” the theory somewhat to explain certain circumstances mentioned previously in this article. We will further improve the precision of the theory further by no longer referring to a customer’s target being certain customers, but instead referring to their target as being performing a certain Job to be Done (JtbD). What’s the difference? Both Raynor and Christensen refer to a one important “why” of how a disruption works by explaining that a disruptive innovation does not target the customers of incumbents, thus making the disruption not seem as a threat to those incumbents and also not interesting for them to pursue themselves. However, customers, in this criteria, is the wrong unit of analysis. Instead, a disruption doesn’t try to satisfy the same JtbD as the incumbent need to satisfy in order to be profitable. Customers is secondary. This, as we will see below in the final definition of what a disruptive innovation actually is, has some implications. With this clarified, we are now ready to create a new definition of what a Disruptive Innovation is. Using only the concept of Activity Fit and Nonprice Value, a Disruptive Business Model can be defined as follows. The disruptor has an activity system that is worse at satisfying JtbD that Incumbents activity systems are targeting: This makes incumbents unwilling to compete – instead ceding the market for your target JtbD to you. At the same time, this allows them to redouble their efforts to improve their ability to satisfy their own JtbD, relieved that you are taking customers that try to push them in other directions away from them. (In short, this introduces that game of checkers that Raynor writes about – read the book for more details on this). The disruptor’s activity system is better than incumbents at satisfying JtbD that incumbents aren’t targeting: This gives you your foothold market. The two different activity systems required to do the two different jobs to be done are not compatible: This makes incumbents unable to compete without losing the edge in their existing business. The disruptor’s value system has a productivity frontier that grows faster than incumbents’ productivity frontier, seen from the incumbents’ jobs to be done point of view: Meaning that over time, the disruptor’s productivity frontier will outgrow that of incumbents’, and satisfy the incumbents’ target JtbD better than they can. Seen from an incumbent’s point of view, this looks something like this: This new competitor seems to be taking some of our customers – but that’s good, those customers are a pain anyway, our core customers are over here, and their business is laughable from that perspective. Hold on – they are taking quite a lot of customers now – and seem to be improving. We should do something similar – but actually that would require us to do X, and that doesn’t work when we’re also trying to do Y. Wait a second, they won this deal over us? We need to do something. But how? We can’t do it when our old customers still want Y, and we can’t do X and Y at the same time. If a customer wants job B but can only get job A from an incumbent, and those two jobs require incompatible activity systems to address, that customer will not be profitable to incumbent or cause more pain than good. Customer will try to drag incumbent down an activity system that would compromise Job A. If your activity system can only perform job B but not job A, incumbent cannot compete. This is a low end disruption. 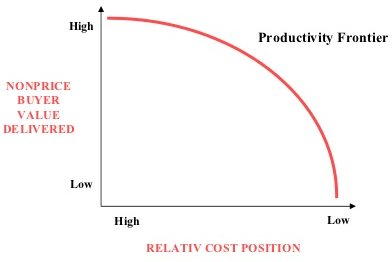 This is when the low-end product takes market from the high end incumbent: incumbent offers job A (high end product, overserving customers’ needs – too expensive and probably too complicated for what they will use) but cannot satisfy job B without sacrifices to Job A, whereas you perform Job B (corresponding with customers needs – just right price) but are not able to serve Job A today, but your trajectory will make you able to do so in the future. In Raynor’s graph, we no longer need the cost axis. High margin or not, the disruptor’s position on the graph is below the incumbent’s in terms of Nonprice Value – and the activity system that produces that position is incompatible with the incumbent’s activity system. Price does simply not matter. A “new frontier” (as Raynor describes it) is actually an activity system that has no fit with the original activity system, and appeals to a new JtbD and not the incumbents’ JtbD. Raynor says “key to disruption is to serve segment unattractive to incumbents”. But actually, it is: “serve jobs to be done that are not able to be served by incumbents’ business models”. Tesla is a prime example of this. The JtbD they are trying to satisfy was not the JtbD that required high-performance cars in terms of travel distance, for example. A Tesla car was initially not good enough for traditional car manufacturers’ customers in many dimensions. Instead, they were targeting another JtbD – one that traditional car manufacturers were not – and could therefore even be seen to be a new-market disruption. They build an activity system encompassing end-to-end production to delivery (incl. manufacturing, design, distribution) custom-designed for this JtbD. Existing car companies could not replicate parts of this and produce as good electric cars as Tesla, and they could not fully “migrate” since the Tesla activity system does not satisfy the old JtbD to satisfaction. Raynor says that the decision tree to determine whether a business model has disruptive potential or not is to start with the question “is it sustaining?”. If you answered yes to both, then you have a foothold market without competition from incumbents. Then, we can proceed with Raynor’s’ questions: Is it Autonomous, and does it have an underlying technology that will enable it to expand the types of JtbD it can do?